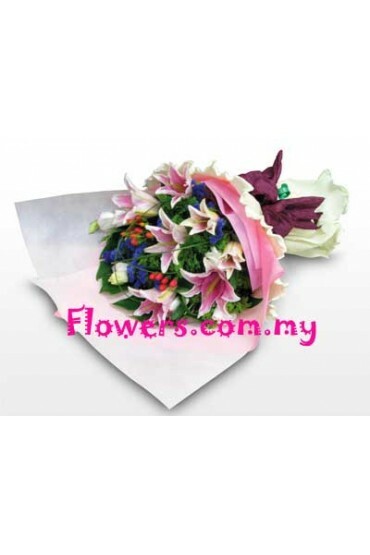 Description: Celebrate the sweetest Valentine's Day with this special lilies bouquet. Melt your loved one's heart with this bouquet with 5 stalks of Stargazers (Pink Lilies), Statice, Berry and other foliages. Send her the SURPRISE and brighten up her day! All areas in Kuala Lumpur, Ampang, Petaling Jaya, Damansara Heights, Damansara Utama, Damansara Jaya, Damansara Perdana, Mutiara Damansara, Subang, Ara Damansara, Puchong, Shah Alam and Klang Valley. Remark: Design may vary for outstation order. Important Note: We DO NOT deliver this product to Perlis, Kedah (except Sungai Petani), Perak (except Ipoh & Taiping), Melaka, Negeri Sembilan, Pahang, Muar, Segamat, Kelantan, Terengganu, Labuan, Sabah & Sarawak from 7th - 16th February.